NEA Master, GRAMMY® Award-winner, drummer and composer Jack DeJohnette knows the multifaceted worlds of jazz and jazz-rock as thoroughly as anyone alive. 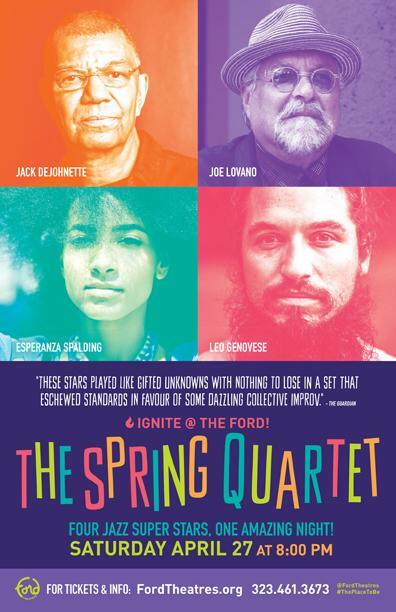 Hailed by The New York Times as “one of the greatest musicians in jazz history,” GRAMMY® Award-winning saxophone giant Joe Lovano has distinguished himself as a prescient and path-finding force in the arena of creative music. Esperanza Spaldinghas always resolutely, intuitively and deftly expanded upon both her art and herself as a world-renowned genre-bending composer, bassist and vocalist. Argentinian pianist Leonardo Genovese has established a solid reputation as an instrumentalist and composer who is not afraid to explore the lesser known corners of the musical landscape.